GoodFarms recently worked with the governor’s office in Baja California, Mexico to help people in the community of San Quintin obtain official birth certificates. Some people, born in remote villages, can get caught in a state of legal limbo when they migrate to more populated areas for work. An official birth certificate is necessary when applying for many jobs, registering to vote, obtaining a passport, signing up for government benefits, and using social services. When Kiko Vega, the governor of Baja California, pledged to help provide original birth certificates during local labor unrest last March, we offered to help make it happen. Our local IT and HR team members cooperated with the local council in San Quintin to help figure out the technological and logistical aspects of the project. 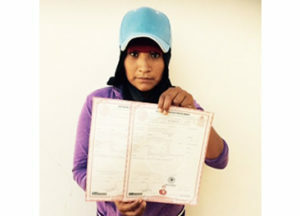 Together we set up a civil registry at the lunch area of our Camalu field near San Quintin, and civil registry personnel were on site for two days printing and distributing the certificates. This is a significant problem in Mexico and we now have a working model to effectively solve the problem and improve peoples’ lives.